When Enterprise went off the air in 2005, that left the Star Trek franchise dormant for the first time since it came back in 1979. While it seemed inevitable that Trek would return at some point, it remained in limbo for quite some time. This makes the reception accorded 2009’s theatrical film Star Trek qualify as nothing less than triumphant. You’d be hard-pressed to call any of the 10 prior big-screen adventures “smash hits”. Most did well, and some were really pretty popular, but they essentially just appealed to the core Trek fanbase. Their reach to a broader general audience stayed limited. 2009’s Trek changed that, as for the first time, a Trek movie became a “must-see” proposition among the uninitiated. The 2009 flick managed to reinvigorate a franchise that turned stale over all the decades. And it did so via a “reboot”. At the start of the film, we see the birth of James T. Kirk – and the heroic death of his father George (Chris Hemsworth). We view Kirk as a rebellious kid (Jimmy Bennett) and trace his unlikely entry into Starfleet as a young adult (Chris Pine). Despite his troubled history, Kirk gains admission due to the recommendation of an old family acquaintance, Captain Christopher Pike (Bruce Greenwood). While at Starfleet, Kirk makes new friends. He immediately buddies up with Dr. Leonard McCoy (Karl Urban) and butts heads with Spock (Zachary Quinto), the ever-logical Vulcan who designs a test that Kirk defeats by cheating. Kirk, Spock and the others find themselves sent into action early when a dire threat emerges. 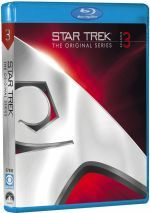 A Romulan named Nero (Eric Bana) arrives from the future with a plan to get revenge on the Federation and right perceived wrongs, so the cadets go into the fray. This leads to a variety of battles and encounters with characters expected and unexpected. Or something like that. While one can sum up the story in a pretty concise manner, that doesn’t mean it plays out as clearly. In truth, Trek’s plot is more than just a bit of a mess. Such is almost inevitably the case when it comes to tales that involve time travel, but Trek feels sloppier than most. I think that’s because the entire Nero plot exists as little more than a MacGuffin. Nero comes back through time not to get revenge – in truth, he does so to reset the Trek universe. Which I must admit is a pretty smart conceit, as it largely freed up the franchise for future films. Had Trek provided a more convention reboot “origin story”, it would’ve been constrained by everything that happened in the 10 prior movies and the jillions of TV episodes. That’s a lot of mythology to contend with, especially since Trekkies are such a hard-core lot. Without the “alternate universe” concept created here, many a nit would be picked. Many a nit has been picked by fans, and I plan to pick a few myself in the ensuring paragraphs. Nonetheless, it becomes very tough for the partisans to complain that this movie’s events don’t fit established Trek lore since they don’t have to do so. The second Nero and company attack in the 23rd century, the series presses the reset button. As such, pretty much anything goes in terms of tampering with established events and timelines. To a certain degree, at least. The challenge here was to make the film’s universe its own without slavish adherence to the previously established timeline but to still feel right. For instance, they couldn’t take Kirk and make him some sort of mealy-mouthed bookworm or whatever. He may have differences with “Kirk Prime”, but he still needs to come across as essentially the same character, or why bother? For the most part, I think the film succeeds, though the actors got stuck in real “rock and a hard place” territory here. On one hand, they needed to strongly evoke the performers who came before them, but on the other hand, they didn’t want to simply imitate them. Given the iconic stature of those predecessors, this became a tremendous challenge. Most of the actors manage to pull it off. Some lean a little more toward “imitation” than others, but most of them give us just enough hints of the earlier actors to please without too much copycat material. Of the entire bunch, I think Pine’s Kirk and Simon Pegg’s Mr. Scott fare the best. The former gets one of the two most challenging parts, and he pulls it off. Pine has to be careful to avoid too many “Shatnerisms”, as it’d be extremely easy to fall into a silly caricature. He throws out deliveries and gestures that suggest Shatner but not ones that directly imitate him. He’s a little more of a renegade in the part, but that makes sense, as this Kirk is a much rawer recruit, and we can discern maturity as the character grows. The Kirk we find at the end of the movie feels more like the TOS Kirk than the one we have at the start, and that’s due to Pine’s nice performance. As for Pegg, he’s just a ball of fun. He’s the last core character we meet, and he makes the most of his late start. Scotty was always a fairly comedic personality anyway, so while Pegg threatens to go a little too far, he never does. He adds some real spark to the film and creates some of its most enjoyable moments. I think the other actors work fine – except for one. While I won’t say that Quinto is bad as Spock, he just never feels right for me. Granted, some of this may result from changes made to fit the alternate universe. From early in this flick, we’re given the impression of Spock as a character with a lot of pent-up anger; he explodes a couple of times as events unfold. In that way, one might excuse/explain Quinto’s rather surly performance as Spock, and one might technically be correct, as within this film’s universe, a darker, meaner Spock makes sense. But dammit, Jim, he just doesn’t feel like Spock to me. Quinto keeps too much of Heroes’ Sylar in him, so this is Spock as Psychotic Potential Serial Killer. Even when Quinto throws off a potentially comedic line, he still looks like he wants to bite off someone’s ear. Quinto isn’t a serious drag on the film, but his performance simply doesn’t work for me. And what’s with the strange, strange decision to make Spock and Uhura (Zoë Saldana) a romantic couple? I don’t get that thread at all. It adds literally nothing to this film, and I can’t see what potential it’ll ever serve. I know that the movie’s creators wanted to put their own stamp on Trek mythology, but the Spock/Uhura pairing just seems like change for change’s sake. Writer/director JJ Abrams made his name via TV series such as Alias and Lost. I never saw those, but I did enjoy his big-screen take on Mission: Impossible 3. This made me optimistic that Abrams could revive Trek in a positive way. With a gross of $257 million, Abrams proved that he could reach a mass audience with Trek. But could he also satisfy established fans? Yes and no. I think 2009’s big-screen effort entertains, but I’m not quite so sure it really qualifies as Trek. I’ve already detailed some of my issues above, and I’m also not entirely wild with the action-action-action tone of the film. Yes, I know that many have criticized the self-important, fusty atmosphere Trek has always generated. It was a franchise that seemed to take itself too seriously and that usually seemed afraid to loosen up and have some fun. Those criticisms aren’t entirely accurate, but I can understand them. I fear that this Trek goes too far in the opposite direction, however. The movie so heavily favors pizzazz and action that it strays a long way from the spirit that makes Trek what it is. Sure, the series always had its own lively elements, but there’s a certain contemplative tone totally lacking from the 2009 movie. It has the superficial elements of Star Trek but just doesn’t feel like its part of the franchise. That doesn’t mean the 2009 Trek isn’t entertaining, though. Indeed, it’s a heck of a ride, and it offers some truly memorable moments. It actually reaches its emotional peak early, as the sequence in which George Kirk sacrifices himself provides a truly moving piece. It’s hard for the rest of the film to live up to it, at least in terms of feeling. But I can’t deny Trek is a blast to watch, as it’s a wild adventure with a great deal of enjoyable material. I simply remain a little stuck on my perception that it may be a fun sci-fi action flick but it just ain’t Star Trek. If that doesn’t bother you, you’ll probably love it. If it does trouble you… well, you’ll still like it, but you may find yourself with less enthusiasm about it. Star Trek appears in an aspect ratio of approximately 2.35:1 on this 4K UHD Disc. Virtually no problems emerged during this strong presentation. Sharpness consistently looked solid. The vast majority of the film offered excellent delineation, with only a few slightly iffy shots on display. Those were exceedingly infrequent, as the movie usually seemed tight and concise. I noticed no issues with shimmering or jaggies. In addition, both edge haloes and source flaws were also absent. While Stsr Trek came with a lot of the usual orange and teal, it branched into other heavily stylized hues as well. This meant a mix of greens, reds, yellows and other tones. Given the constraints, the colors looked good and came across as intended. Blacks appeared dark and dense, while shadows were smooth and well-developed. This was a fine image. Similar praise greeted the Dolby Atmos soundtrack of Star Trek. Downconverted to Dolby TrueHD 7.1, the mix boasted multiple opportunities for involving material, and it took advantage of these. Of course, the big space battles used the soundscape the best, as those became vivid and involving. Crafts, explosions, and weaponry zipped around the room to form a terrific sense of the action. Other scenes worked well, too. The audio conveyed atmosphere in a fine way, as we felt immersed in the workings of the various ships. Across the board, the track made the places seem accurate and engrossing. Audio quality was also more than satisfactory. Speech was natural and concise, with no edginess or other issues to detract. Music appeared lively and full, and effects worked spectacularly well. They always sounded vivid and dynamic, with clean highs and some serious bass. This was a very positive soundtrack. How did the 4K UHD compare to the Blu-ray version? The Dolby Atmos track added a little kick and range, while visuals seemed a bit tighter, with more dynamic hues. This didn’t come across as a big upgrade on the Blu-ray, but the 4K still turned into the more satisfying rendition. No extras appear on the 4K UHD itself, but a Blu-ray Copy offers the same materials found with the original release. On Blu-ray One, we get an audio commentary from director JJ Abrams, executive producer Brian Burk, producer Damon Lindelof and writers Roberto Orci and Alex Kurtzman. All sit together for a running, screen-specific look at cast/characters/performances, set and visual design, music and audio, effects, costumes and makeup, script/story areas, deleted/altered sequences, “rebooting” the franchise and dealing with Trek canon, and other influences. Despite a lot of happy talk – evidence by frequent remarks about how the participants love this or that about the film – we get a good examination of the flick. The commentary definitely covers a wide array of subjects, and I especially like the focus on screenplay, plot and character issues. I could live without all the self-praise, but there’s more than enough useful content to make this a solid chat. Over on Blu-ray Two, most of the content comes in the form of featurettes. Many of these include optional branching content. When activated, these “pods” split off from the main program and offer additional info. First comes the 16-minute, 41-second To Boldly Go. 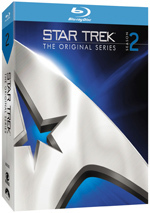 It offers notes from Abrams, Orci, Kurtzman, Lindelof, Burk, and actor Leonard Nimoy. They discuss some issues with the reboot and the story. A few new tidbits emerge, but I feel like most of this already appears in the commentary. It’s still a good featurette; it just feels a bit redundant. I do like the shot in which Nimoy tells new Spock Zachary Quinto that he’s stuck with Trek for life. He laughs as he tells Quinto “you’re screwed”, but you know he kinda means it. “Boldly” comes with four branching pods: “The Shatner Conundrum” (1:58), “Red Shirt Guy” (0:43), “The Green Girl” (3:25), and “Trekker Alert!” (2:22). “Shirt” is just a silly piece of fluff, but “Girl” is a good look behind the scenes, as it shows how the makeup folks transformed actor Rachel Nichols. “Conundrum” gives us thoughts about why Shatner didn’t appear in the film, while “Alert!” shows some Trekkies on the set. Actors come to the fore in Casting. This show runs 28 minutes, 53 seconds and features Abrams, Burk, Orci, Nimoy, Kurtzman, original castmember Nichelle Nichols, 1st AD Tommy Gormley, and actors Chris Pine, Zachary Quinto, Karl Urban, John Cho, Zoë Saldana, Bruce Greenwood, Anton Yelchin, Eric Bana, and Simon Pegg. We learn about the cast and what they brought to their characters. A fair amount of praise emerges here, but more than enough good content compensate. We find some decent insights into the casting process, and a lot of behind the scenes footage adds impact. After this comes the 19-minute, 31-second A New Vision. 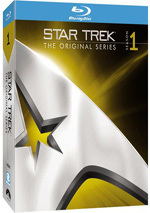 It offers statements from Abrams, Burk, Orci, Kurtzman, Gormley, Nimoy, Pine, Urban, Saldana, Quinto, production designer Scott Chambliss, executive producer Jeffrey Chernov, visual effects supervisor/2nd unit director Roger Guyett, director of photography Dan Mindel, ILM visual effects supervisor Russell Earl, and ILM animation supervisor Paul Kavanagh. “Vision” gets into the film’s tone and inspirations as well as various visuals aspects like photography, locations, and effects. In the latter area, practical effects come to the fore, and those offer some of the most interesting aspects of the piece, as it’s fun to see the old-fashioned methods used in the flick. One “Branching Pod” shows up here. “Savage Pressure” (3:08) features Gormley and Abrams. The piece focuses on Scottish Gormley’s vocal affections and provides a mildly amusing glimpse at the AD. In the next few programs, we dig into technical areas. Starships fills 24 minutes, 33 seconds with info from Abrams, Nimoy, Chambliss, Burk, Guyett, Earl, Kavanagh, Pegg, Chernov, Pine, Urban, Kurtzman, Yelchin, Saldana, Cho, Orci, Bana, supervising location manager Becky Brake, visual effects art director Alex Jaeger, digital model supervisor Bruce Holcomb, and digital models and simulation John Goodson. Viewpoint supervisor Russell Woodall, and actors Faran Tahir and Jennifer Morrison. As expected, this show looks at the design and execution of the movie’s starships. We get a good mix of facts about locations, effects, and other techniques used to create the variety of vehicles. I especially like the discussion of the new Enterprise’s bridge design. Seven “Branching Pods” appear with “Starships”. We find “Warp Explained” (1:22), “Paint Job” (1:14), “Bridge Construction Accelerated” (1:17), “The Captain’s Chair” (0:45), “Button Acting 101” (1:44), “Narada Construction Accelerated” (1:20) and “Shuttle Shuffle” (1:46). The two “Acceleration” clips are interesting since they show time-lapse glimpses of set creation. The other bits offer decent thoughts, though they tend to remain insubstantial. I do like “Acting”, as it discusses the goofiness of pretending to fly starships. During the 16-minute, 29-second Aliens, we hear from Guyett, Pegg, Nimoy, Quinto, Bana, Kurtzman, Kavanagh, Delta Vega creatures, Romulans, insect and aliens designer Neville Page, Vulcans and Romulans creator Joel Harlow, and aliens designer and creator Barney Burman. Once again, we find a featurette with a self-explanatory title. This one examines the design and execution of the movie’s alien races. We learn about makeup, prosthetics, costumes and effects used to bring these characters to life. I’d like a little more about the more obscure species – Vilcans and Romulans dominate – but we still find lots of nice info here. In particular, it’s cool to hear Nimoy critique Vulcan ears. Five “Branching Pods” accompany “Aliens”. We locate “The Alien Paradox” (1:40), “Big-Eyed Girl” (1:25), “Big Bro Quinto” (1:26), “Klingons” (1:57) and “Drakoulias Anatomy 101” (1:35). All offer interesting tidbits, though I especially like “Klingons” since it’s our only glimpse at those characters, as the final film omits them. Planets goes for 16 minutes, 10 seconds, and features Chambliss, Quinto, Brake, Guyett, Earl, Burk, Pine, Cho, Chernov, assistant location manager Kathy McCurdy and special effects supervisor Burt Dalton. The program examines locations and attempts to create alien worlds as well as a futuristic Earth. By this point, we know what to expect from these featurettes, and “Planets” delivers another informative program. It gives us good details and fleshes out the techniques well. This area offers two “Branching Pods”. We get “Extra Business” (2:29) and “Confidentiality” (2:45). “Business” looks at the work of extras on the set, while “Confidentiality” examines efforts to ensure that info about the film didn’t emerge. Both are good, though I particularly like the borderline paranoia necessary to keep Internet nerds from exposing everything about the flick in advance. With the nine-minute, 22-second Props and Costumes, we locate details from Burk, Abrams, Kurtzman, Orci, Saldana, property master Russell Bobbitt, and costume designer Michael Kaplan. The show examines communicators, phasers, tricorders, ear pieces, and different outfits. All the material works, especially when the participants discuss attempts to remain fairly true to TOS designs. Only one “Branching Pod” accompanies “Props”. “Klingon Wardrobe” (1:08) offers another quick look at the deleted characters. It’s another fun peek at how this film would’ve used the notable Trek villains. Audio dominates in Ben Burtt and the Sounds of Star Trek. It goes for 11 minutes, 45 seconds as we hear from special effects and montage sound designer Burtt. He talks about the audio used in the original series and lets us know what he did to update those elements. Burtt is pretty much the best in the business, and it’s always fascinating to hear him get into his work. We learn about music in the six-minute, 28-second Score. It includes remarks from Abrams and composer Michael Giacchino. We get notes about the film’s music in this engaging and informative piece. Finally, Gene Roddenberry’s Vision lasts eight minutes, 47 seconds. It features Nimoy, Abrams, Orci, Kurtzman, Lindelof, Trek graphic designers/historians Denise and Michael Okuda, science consultant Carolyn Porco, Trek producer Rick Berman, filmmaker Nicholas Meyer, and Enterprise executive producer Manny Coto. The participants discuss the era in which Roddenberry came up with “The Original Series” and looks at his goals/work for the series. While I obviously respect Roddenberry’s legacy, “Vision” gives us a pretty generic take. We don’t really learn much about Roddenberry and generally get bland thoughts here. Nine Deleted Scenes fill a total of 13 minutes, 30 seconds. We find “Spock Birth” (1:52), “Klingons Take Over Narada” (0:47), “Young Kirk, Johnny and Uncle Frank” (1:36), “Amanda and Sarek Argue After Spock Fights” (0:38), “Prison Interrogation and Breakout” (3:08), “Sarek Gets Amanda” (0:23), “Dorm Room and Kobayashi Maru (Original Version)” (3:59), “Kirk Apologizes to the Green Girl” (0:54) and “Sarek Sees Spock” (0:13). Most deleted scenes are inconsequential trims, and that’s true of some of these clips. However, the Trek cut sequences prove to be much more interesting than most. We find an entire deleted subplot that involved Klingons, and we watch more of Kirk and Spock as kids. Expect to find a lot of fun bits among this intriguing collection of segments; they hint at different directions the film might’ve taken. We can watch the deleted scenes with or without commentary from Abrams, Lindelof, Kurtzman and Burk. (I guess Orci went out for a sandwich.) We get info about the sequences, find out why they were cut, and a few wisecracks. They continue to offer fun, useful notes. An interactive component arrives via the Starfleet Vessel Simulator. This allows you to check out details of the Enterprise and the Narada. Via these, you can inspect the ships from various angles and read text notes about their components. This turns into a good way to learn more about the two vessels. Next comes a Gag Reel. The clip lasts six minutes, 22 seconds as it shows various forms of silliness from the set. It’s pretty typical blooper material, so don’t expect anything particularly interesting. Disc Two finishes with some Trailers. This area provides four clips. We get the teaser as well as three theatrical trailers. As a series reboot, Star Trek came as a tremendous financial success. Does it work as well in terms of its creative side? Yes and no. While it’s a rousing adventure, it just doesn’t feel enough like Star Trek to totally satisfy. The 4K UHD provides excellent picture and audio along with a terrific set of supplements. 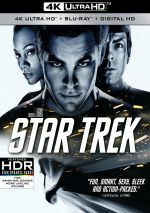 Though I have a few reservations about the 2009 Trek, I still think it’s an enjoyable movie, and this 4K UHD brings it home in fine fashion.